My husband had a birthday recently. He's 31 this year and life has been busy, so I didn't throw a party or anything (he had a very fun 30th! ), but I still wanted to make sure it's a special day. So, I took him out for a steak at Bavette's (his choice-- and I did not complain) and I made him a birthday treat to take to take to work. Alex has a big sweet tooth (and yet, he's really skinny... go figure), but I know that there are a few things that are on his favorites list: donuts (which I won't attempt to make on my own), red velvet cupcakes (made those for his 28th), cookie cakes (made for his 29th), anything with Nutella (he got these confetti cupcakes with Nutella frosting for his 30th birthday), and finally, key lime pie. I considered making him a key lime pie or mini pies, but figured that those would not transport to work very well. So, instead I decided to pull the great flavors of key lime pie into another treat that Alex loves: blondies! I love blondies because they are so buttery in flavor, easy to make, and can be totally customized with different mix-ins. For these blondies, I stirred in key lime juice for that great tart sweet key lime flavor, added sweet white chocolate chips, and baked them in mini muffin pans so that they were already perfectly portioned little bites for Alex to share with his co-workers. I loved the bright citrus flavor in these little bites, but after sampling one from the first batch, I decided that they needed a little something more for the flavor to really pop. So, I whisked up a simple tangy key lime glaze to drizzle over the top and it was the perfect complement to these buttery little bites! Preheat oven to 375 degrees. Coat a mini muffin pan with cooking spray and set aside. Melt butter in a large microwave safe bowl. Stir in the sugars until fully incorporated and allow the mixture to cool to room temperature. In a separate medium bowl, combine flour, baking soda, salt, and lime zest. Beat the eggs, vanilla, and key lime juice into the butter and sugar mixture. Whisk in the dry ingredients a little bit at a time until fully incorporated and a smooth batter is formed. Fold in the white chocolate chips. Drop the batter by large spoonfuls into the mini muffin cups, filling each cup about 3/4 of the way up. Bake for 11-13 minutes, until golden around the edges and a toothpick inserted into the center comes out clean. Cool slightly and then remove from the muffin pan and cool to room temperature on a wire rack. Meanwhile, whisk confectioner's sugar, vanilla, and key lime juice together. 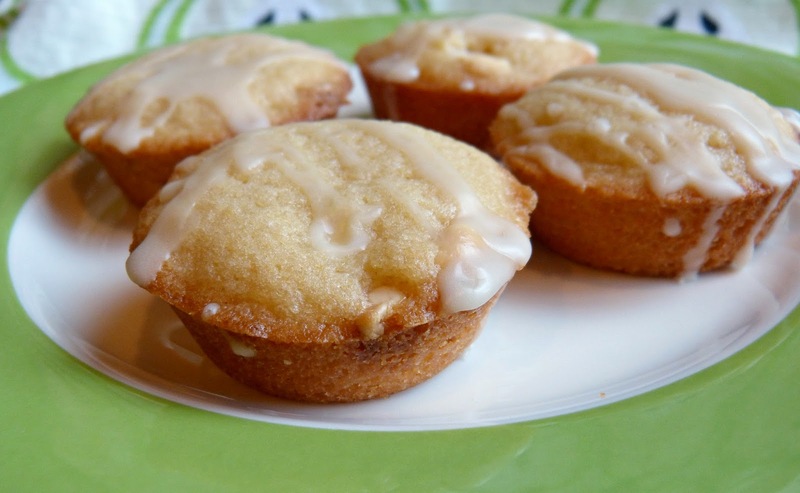 Drizzle icing over the tops of the blondie bites and let them sit for an additional 10 minutes (to allow icing to set) before serving or storing. Looking for more treats? 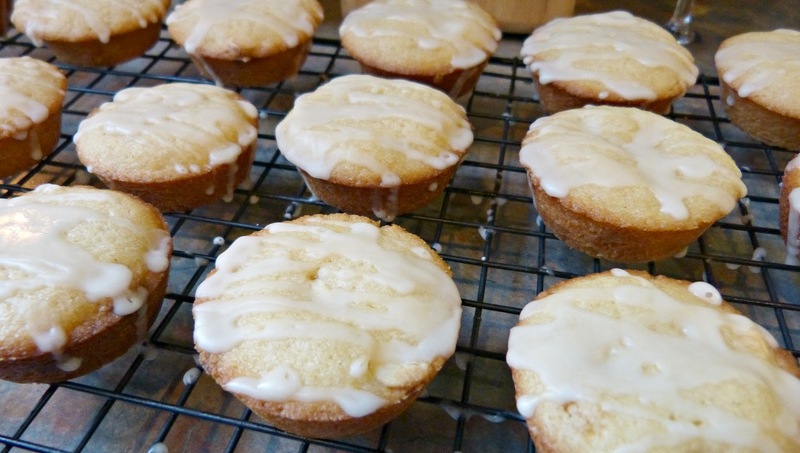 Try Raspberry Swirl Lemon Cake Bars or Black Bottom Cupcakes! 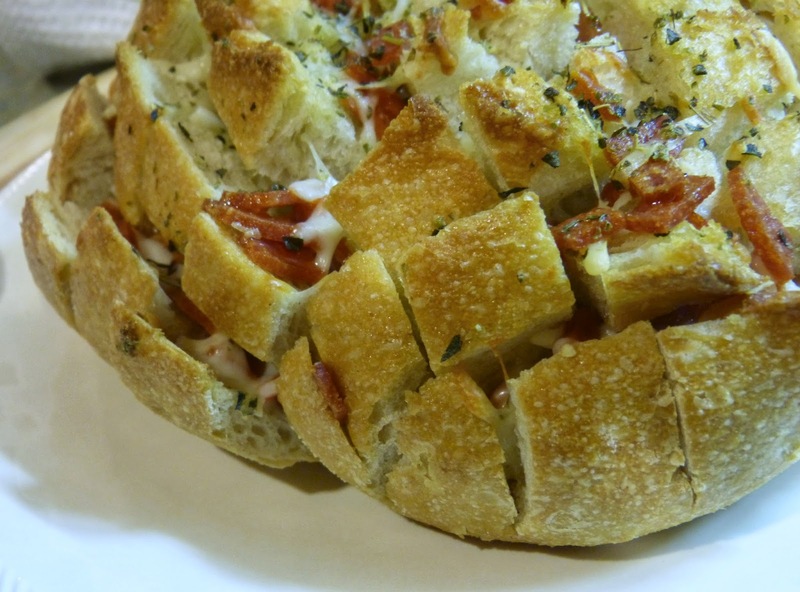 So, I finally broke down and jumped on the cheesy/pull apart/monkey/party bread... and it was really good. Truthfully, I wasn't going to give this one a try as, let's be honest, there aren't many redeeming health qualities about a loaf of bread stuffed with cheese. But on a recent Saturday morning I was working on some posts and watching The Kitchen on Food Network when Chef Marcella whipped up a loaf of this cheesy party bread. My husband rarely pays attention when I am watching cooking shows (it's basically the equivalent to my attention span when he's watching football), but he gave it a quick glance and immediately asked, "can we make that?" And so we did. I decided that if we were going to go ahead and make this decadent bread, then I might as well call it dinner (with a green salad on the side, of course) instead of a snack. 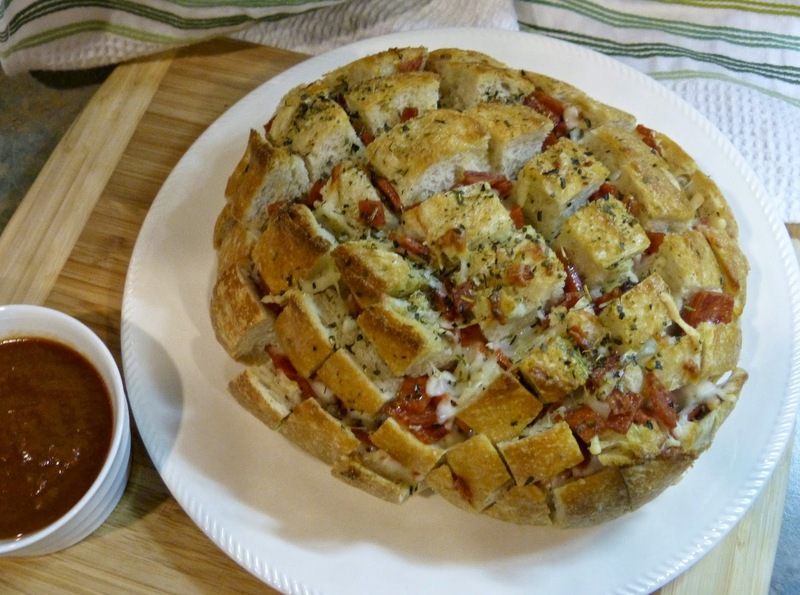 So, I put a little pizza twist on mine: a combination of mozzarella and Parmesan cheeses, diced pepperoni, and warm marinara for dipping made this bread totally delicious. It also couldn't be easier-- just make deep scores in a ready made loaf of bread, stuff it with cheese, seasoning, and any other fixings (I had another great idea for this involving Gruyere and caramelized onions...), bake, and then pull apart and enjoy! I couldn't stop eating it and definitely needed to hit the gym the next day, but it was worth it. This bread is perfect for a fun weekend dinner, for an easy party appetizer, or something to snack on during a big game. March Madness, anyone? Place the loaf of bread on a cutting board and score the loaf by making cuts all the way across and 1 inch apart, but not cutting all the way through. Slice down until about 1/2 inch is left at the base of the loaf so that the slices are still connected. Rotate the loaf and repeat, scoring at an opposite angle to create a checkerboard pattern of roughly 1-inch square strips of bread. Place the cut loaf on a foil-lined baking sheet. Melt the butter in a small bowl and then stir in 1 Tbs. olive oil, 1 tsp. Italian seasoning, garlic, salt, a pepper. Carefully pour the mixture evenly throughout the cuts in the loaf. In a medium bowl, combine the cheeses and pepperoni. 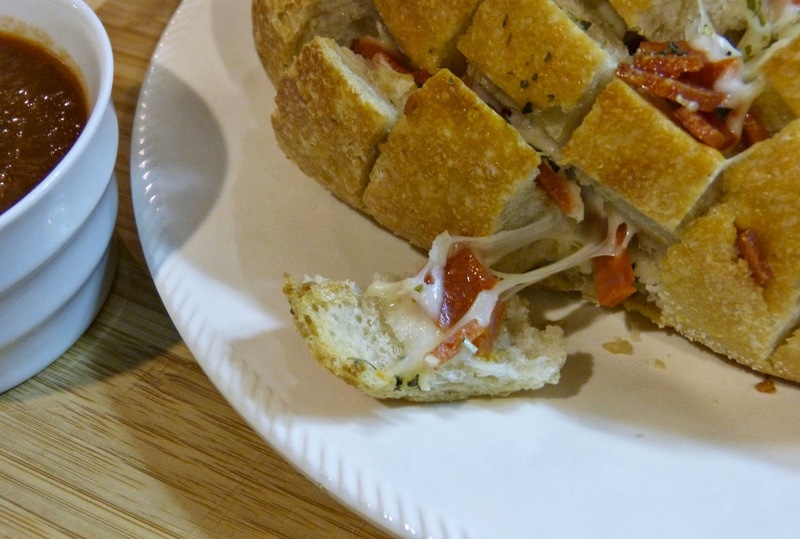 Using your fingers, take clumps of the cheese and pepperoni mixture and stuff in between the cuts in the bread, being sure to push the mixture toward the base of the bread. Do your best to evenly distribute the cheese mixture throughout the loaf. Drizzle the top of the loaf with olive oil and sprinkle evenly with the remaining 1/4 tsp. of Italian seasoning. Bake for 18-20 minutes until bread is golden brown on top and cheese has melted. Serve warm with sauce for dipping, if desired. Loosely based on recipe by FiveHeartHome. Looking for another good party snack? Try Grilled Corn & Avocado Salsa or Baked Three Pepper Quesadillas! 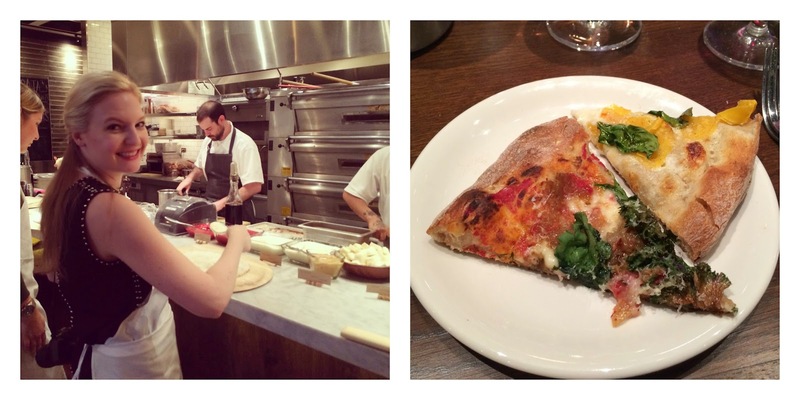 Alex and I had dinner at Stella Barra Pizzeria a few weeks ago and I have been meaning to tell you all about it. 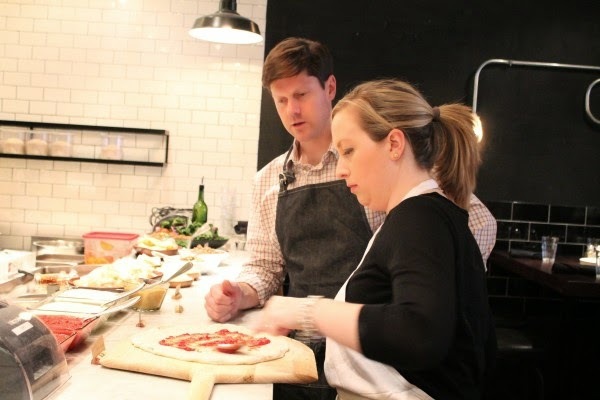 Shame on me for not getting around to it, but I am glad I waited because I just returned for a second visit that was even more fun than the first: I joined a few other lucky food bloggers for a private pizza making class with chef Jeff Mahin at the Lincoln Park restaurant. Stella Barra is one of Lettuce Entertain You's newest restaurants and it is the third Stella Barra location in the US (with the first two in southern California), but it is quickly becoming a Chicago favorite. Chef Mahin and his partner Francis Brennan began working together at high end LEYE restaurant L2O and have gone on to open Stella Barra, of course, as well as Do-Rite Donuts in the Chicago Loop. They mutually found the inspiration to open a laidback pizza restaurant from their own great memories of their favorite no frills northern California pizza spot. These guys are passionate about food and it totally shows-- from the cool urban details of the restaurant to the unusual and creative combination of items on the menu. 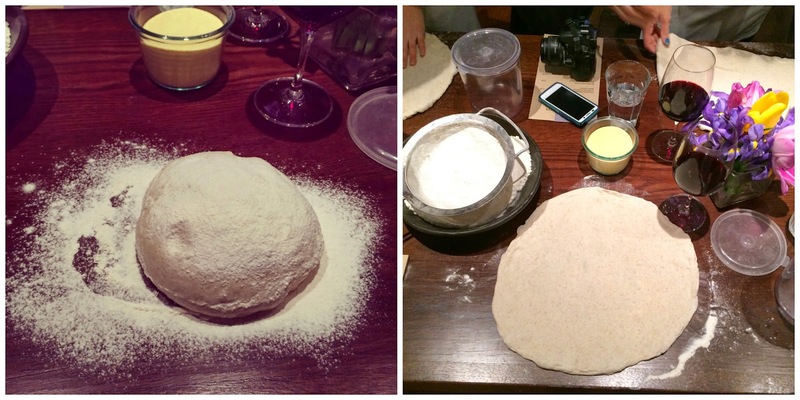 We started pizza class with a lesson in dough and crust making-- and even the details that went into that were pretty remarkable. The chefs use a flour blend that has this great nutty flavor that is super unique in a pizza crust. And when each of us arrived we had a ball of dough to work with that had been prepped way in advance to allow the yeast to ferment properly. The chefs helped us stretch our dough and even gave us a lesson in tossing (which I find frightening) before we got to customize our own pizzas. It was tough to decide how to top our pizzas because the Stella Barra staff laid out quite the spread of traditional and interesting ingredients. Ultimately, I topped mine with Stella Barra's tomato sauce, housemade Italian sausage, caramelized onions, taleggio, and purple kale. My friend Kit from The Kittchen was also in attendance and-- a girl after my own heart-- she saw my pizza and went for something totally different on hers knowing that we would share our creations when we were done. 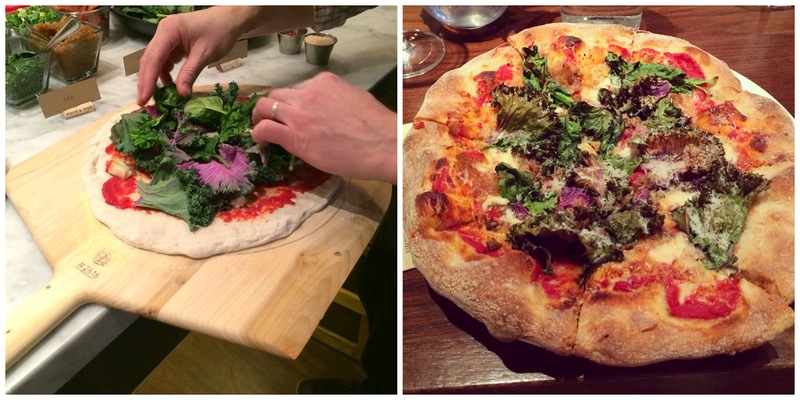 Kit's pizza was topped with Stella Barra's white sauce, Pecorino Romano, butternut squash, and kale. Both were seriously delicious, if I can toot my own horn here! As if serving us wine and then making and tasting our own pizza wasn't enough, the Stella Barra staff brought out a ton of other menu items for us to taste including smoked grapes and a super creamy burrata that they serve on their appetizer menu and a few of their signature pizzas. I was really excited to see my favorite Stella Barra pizza arrive at the table-- I ordered it for dinner when Alex and I first visited and couldn't get enough: butternut squashi, taleggio, fresh herbs, candied bacon, and fresno chiles. It's an amazing combination of sweet/salty/savory/spicy. I'm pretty sure it is the only pizza I will ever order at Stella Barra because it's just that good. Chef Jeff also treated us to one of his favorite desserts: individual weck jars of butterscotch custard topped with homemade salted caramel. I have to be honest with you: if I saw the words butterscotch, custard, or caramel on a menu I likely wouldn't order it-- especially if they were all in the same dish. That's just not my thing. Well, I stand corrected because I was scraping the jar with this one. The custard was eggless, so it wasn't like a flan (thankfully, because I'm not a flan fan) and it was just super creamy almost like a creme brulee... and the salted caramel just makes it. And if you stop into Stella Barra for dinner and don't have room for dessert, then you are in luck. In the vestibule that they share with Summer House Santa Monica, is an amazing little bakery counter where you can grab sweet treats to go on your way home! I am a huge fan of the oatmeal apple pie cookie, the fleur-de-sel chocolate chunk, and also the Rice Krispie treat chocolate chunk. All of the cookies are huge, soft, and rich... just what you want! I was a huge fan of the food and the atmosphere after our first dinner at Stella Barra, but after this second visit I was totally sold. Really good food is one (very important) thing, but to also have an opportunity to meet the guys behind the restaurant and find out that they are just really nice fun guys made me love it even more. I can't wait to come back for another date night or for our next girls' night out! Thanks so much for a great evening, Stella Barra Pizzeria! As much as I love to experiment in the kitchen, sometimes it is really hard to keep that creative momentum up during busy weeknights. This recipe was born out of ingredients that I had on hand on a busy weeknight when I was just really sleepy and not in the mood to make anything elaborate. Well, it turned out to be really tasty! If you've got a can of tomatoes and a little white wine (and if you're like me, you usually have both in your kitchen), then you can make this simple sauce. Chicken breasts are sauteed and then nestled in a simple pan sauce of tomatoes, shallots, garlic, and white wine. It's a very basic combination, but one that works so nicely together. The sauce is light, but flavorful and a sprinkling of red pepper flakes adds some great heat to a somewhat sweet sauce. It's such a great combination! You could totally serve this as a meatless dish with some simple grilled or sauteed vegetables. It would also be great with shrimp instead of chicken too. Heat oil and butter in a large saute pan over medium-high heat. Swirl to coat. Season chicken breasts on both sides with salt and pepper and add to the pan. Cook chicken until browned on both sides, about 5-6 minutes per side. Remove from pan and transfer to a plate. Reduce heat to medium and add shallots to the pan. Saute for another 3-4 minutes, stirring frequently until shallots are soft, but not brown. Add garlic and saute for 1 more minute, stirring constantly. Carefully pour wine into the pan and scrape up any brown bits from the chicken. Simmer the wine until it has reduced by about half, about 6-8 minutes. Pour in the tomatoes, bring to a boil, then reduce heat to medium and simmer for another 5 minutes. Add chicken breasts back to the pan and submerge in sauce. Cover pan and cook for 10-15 minutes until chicken is cooked through and tender and sauce is thickened. 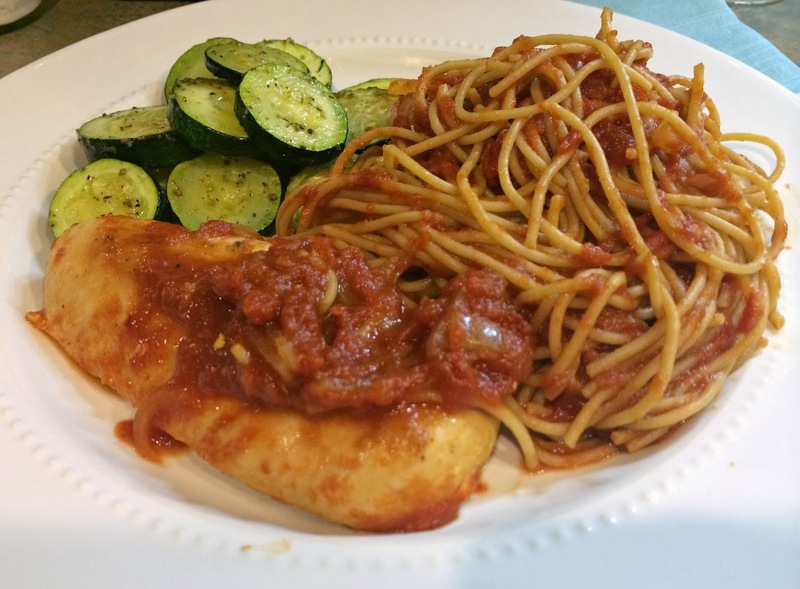 Looking for another chicken and pasta dinner? 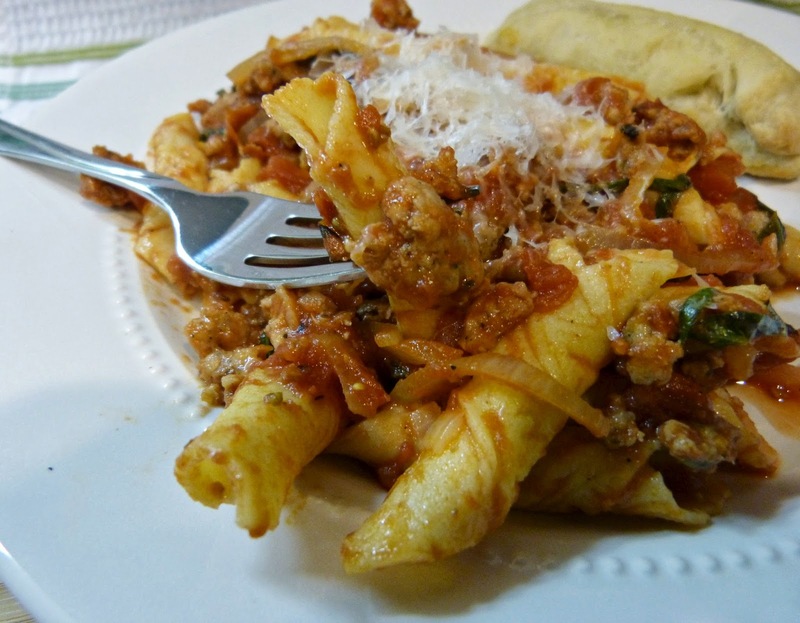 Try Top Chef Chicken Rigatoni or Chicken in Red Wine Sauce. Hey everyone! Welcome to the first of my Tastemaker Top 10 guest post series! The Tastemaker Top 10 is a collection of 10 questions asked by me and answered by some of my favorite bloggers. Here they will tell you a little bit about themselves, their blogs, and of course, their favorite foods and restaurants. 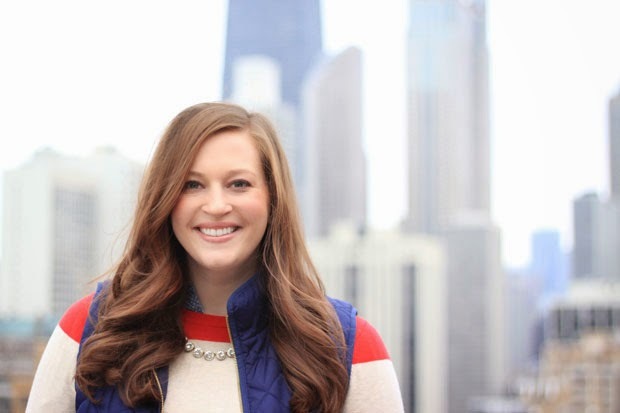 Today we're talking to Lauren, author of lifestyle blog Lion + Maven and co-founder of both the Windy City Blogger Collective and Cinq: A Chicago Food, Wine, & Social Club. She's a busy girl, so I'm so happy that she took the time to answer my questions and is my very first featured Tastemaker! In a few sentences, tell us a little bit about your blog. Lion + Maven is a lifestyle blog that mainly focuses on food and travel, but I also enjoy throwing in other topics that I really love and I think my readers would enjoy. 1. Favorite meal, food, or cuisine: This is such a tough question because there is so much I love! I love a great cut of steak, I love all the aromatic spices in Indian food, and I've never been one to turn down a taco, but when it comes down to it I think that pizza has to be my #1! 2. Least favorite meal, food, or cuisine: I'm half Greek so most people think it's really odd that I can't stand olives. I've tried on many, many occasions but they're just not for me! 3. Favorite restaurant in your city: Hands down Bavette's. I'll stop in here and grab a seat at the bar and have a meal all by myself, that's how much I love it! They have great wine and everything I've ever eaten here is fantastic-but I definitely recommend the Shrimp De Jonghe, Shortrib Stroganoff, any of the steaks, and the Chocolate Pie! 4. Favorite restaurant outside of your city: The Melting Wok in Ubud, Bali. My husband and I were there last summer for our honeymoon and I had the best Chicken with Coconut Curry that you could ever imagine-AND it only cost the US equivalent of $3.50! 5. Favorite guilty pleasure food: Probably donuts...or cupcakes-specifically Molly's cookie monster cupcake that's stuffed with cookie dough...sweets are my downfall! 6. Favorite ingredient (something you love to cook with, or something you see on a menu and know you have to order): I love short ribs, so anytime I see those on the menu it's pretty safe to say that I'll be trying the dish! I also really love adding bright flavors like cilantro and basil to my cooking whenever I can. 7. Favorite recipe: My favorite recipe is one that's always a crowd pleaser- my Spicy Shrimp Scampi. It was the first dish I ever cooked for my husband over 5 years ago and he still always asks for it! 8. Favorite kitchen tool, utensil, product, etc. : It's not the most basic of tools but I really love my vegetable spiralizer! Zucchini noodles are a great healthy alternative to pasta and they're just so fun make! Amazon is constantly marking this down, so be sure to keep an eye out and you'll get a great deal. If you need inspiration you can check out Ali's blog, Inspiralized, for tons of great recipes! 9. Favorite thing about blogging: Obviously I love writing and sharing my thoughts and experiences with my readers but I also love all the wonderful people I've met through blogging and the great new friends I've made. 10. Five favorite blogs/blogs that A Squared readers should know about: I have found so many great blogs lately that it's really hard to pick just 5! My husband and I are visiting Germany this fall so I've been pouring over Casey's blog, We Took The Road Less Traveled, for travel ideas. Whenever I'm in need of a little everyday fashion inspiration I turn to Kelsey's blog, Ladies in Navy, because I'm a big fan of her style. Kailley's Kitchen has some amazing food photography that always has me drooling and Against All Grain is my go-to for Paleo recipes. For beauty advice I always turn to Laurie at 312 Beauty. Thanks so much for your thoughts, Lauren! This week's lunch is a healthy recipe inspired by one of my favorite Italian rituals: Aperitivo. Aperitivo is essentially, happy hour in Italy. It isn't quite the same as American happy hour because it's actually better... For a few hours in the evening you can go to an Italian bar and pay 8-10 Euro for a a cocktail and then you get to enjoy some amazing snacks while you sip. This isn't the peanuts and pretzels or even the buffalo wings that you'll get here in the States, but plates or buffets of really good food like cheeses, grilled vegetables, bruschetta, pastas, and salads. It's a wonderful tradition and I highly recommend that you give it a try if/when you find yourself in Italy. Some aperitivos are misses, while others are most definitely hits. When I was living there, our favorite place for aperitivo was Kitsch. They offered a serious buffet full of really good food so this was like a jackpot for a bunch of cheap American college students-- and a handful of our professors that regularly hung out there with us. 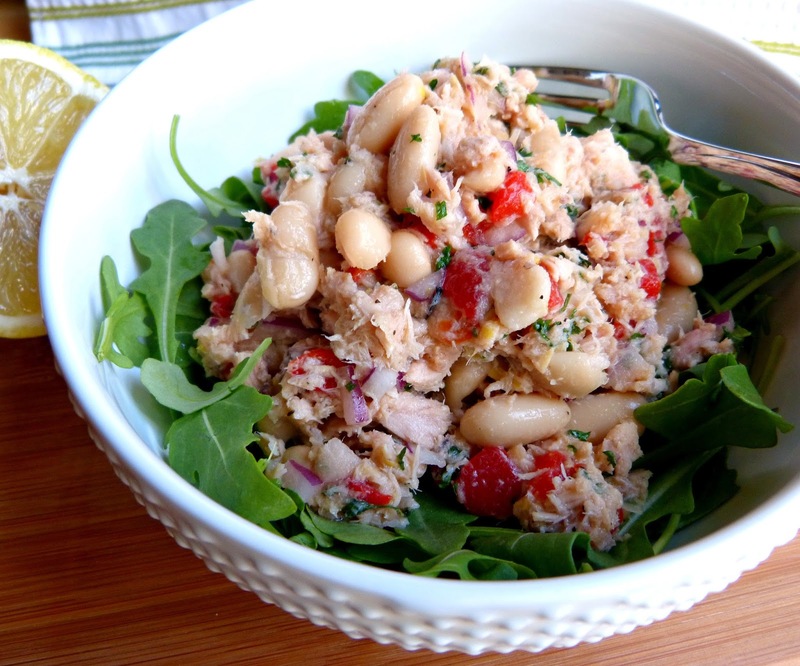 Add tuna to a large bowl and use a fork to lightly break up and flake the meat into smaller pieces. Add beans, peppers, and onions to the bowl stir to combine. In a small bowl, whisk together lemon zest and remaining ingredients through salt and pepper. Pour over the tuna mixture and stir to incorporate. Serve the salad over arugula (my favorite way), with crackers, or on its own. 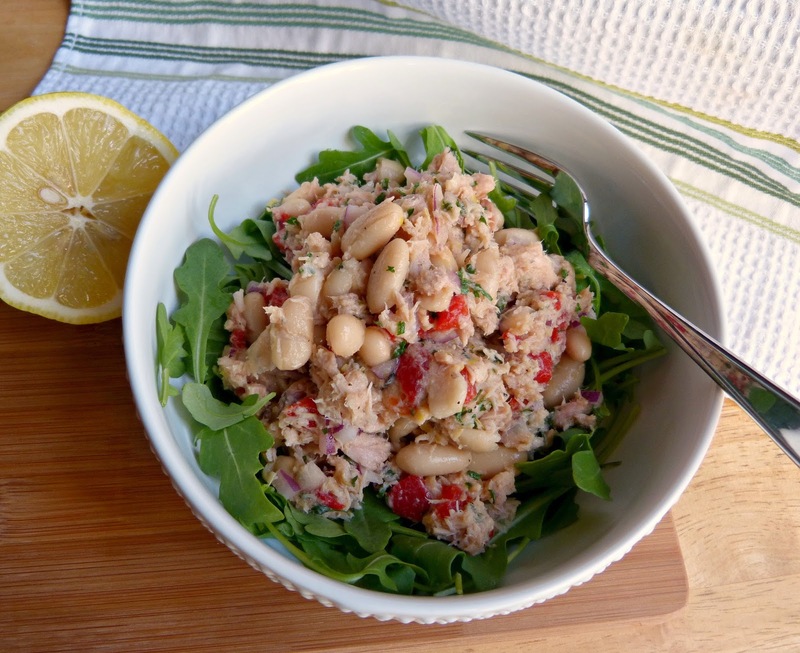 Do you need another healthy salad recipe? Try Roasted Vegetable and Spinach Quinoa Salad or Brussels Sprouts & Apple Detox Salad! I'm a creature of habit when it comes to weekday breakfast. I start almost every day with a cup of coffee and a bowl of oatmeal with fruit and nuts. It's not terribly exciting, but it helps me start my day with energy and without a lot of thought-- I'm not much of a morning person, so the less creative thinking I have to do at 7 AM, the better. Sometimes, though, that bowl of oatmeal is just really boring. 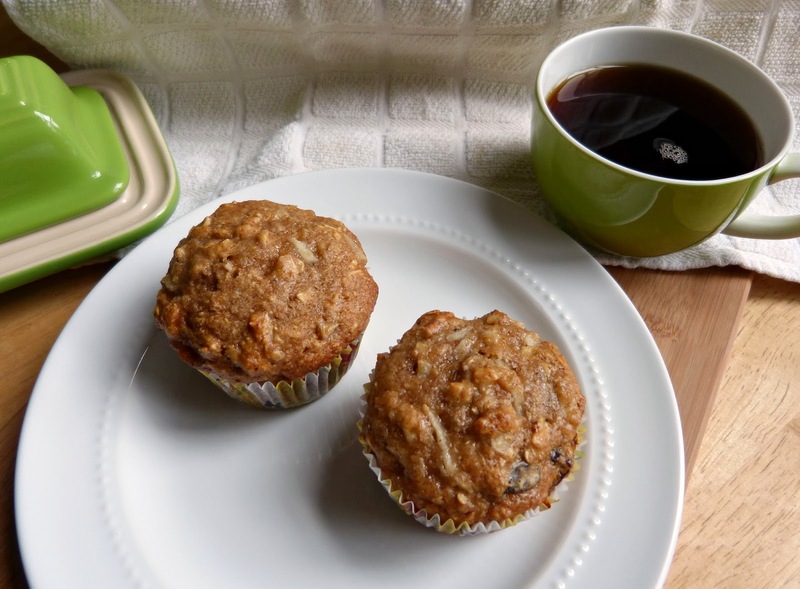 Last weekend I decided to do something a little different and make my weekday breakfast even easier: by turning my usual bowl of oatmeal into a portable muffin. 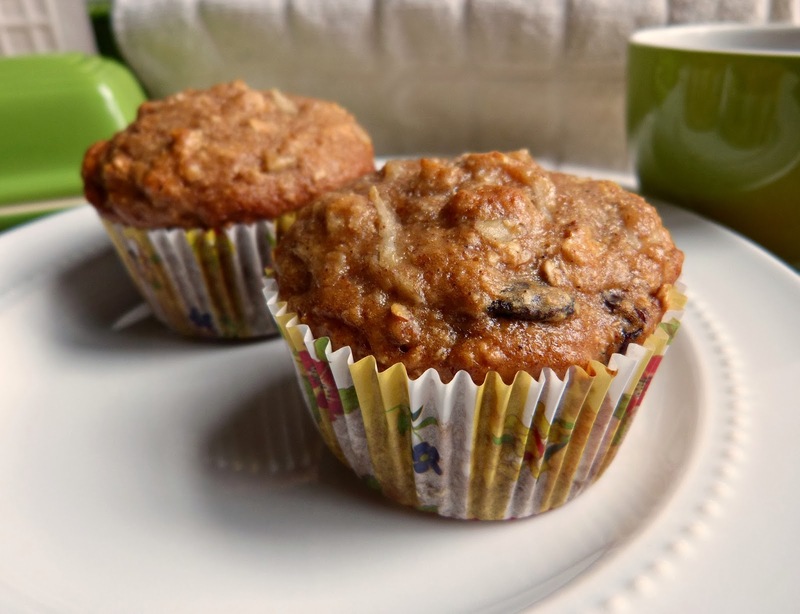 These muffins are really easy to make and are full of healthy ingredients: pears, pecans, whole wheat flour, oats, and Greek yogurt. And the flavor is great! They are just sweet enough and super hearty, so a muffin, a banana, and a cup of coffee is all I need to get me through the morning. These are really easy to customize too. You could sub in apples for pears, dried cranberries or diced dried apricots for the raisins, and walnuts or almonds would both be delicious in place of the pecans. You could also stir in 1/4 cup of dried coconut to add another delicious layer of flavor here too. 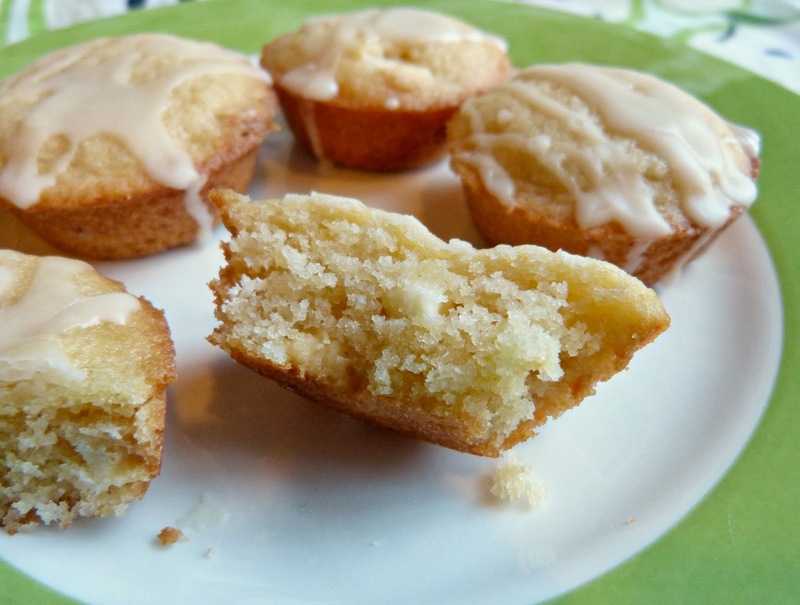 These muffins freeze really well and also make a great midday snack. Bake up a batch to keep on hand for those days when you are not feeling like a morning person. And if you're like me, you may need to double the recipe! Preheat oven to 350 degrees. Prepare a muffin tin with paper liners and set aside. In a large mixing bowl, combine flour, oats, cinnamon, baking soda, salt and nutmeg. Create a well in the center of the mixture and set bowl aside. In a separate medium bowl, beat the egg well. Whisk in sugar, honey, yogurt, and oil and then stir in the pear until combined. Pour the mixture into the dry ingredients and stir to combine. Fold in raisins and pecans. Spoon batter into the muffin liners. Bake for 18-22 minutes, until muffins are golden and a toothpick inserted in the center comes out clean. This recipe yields about 1 dozen full sized muffins. Looking for more delicious breakfast baking? 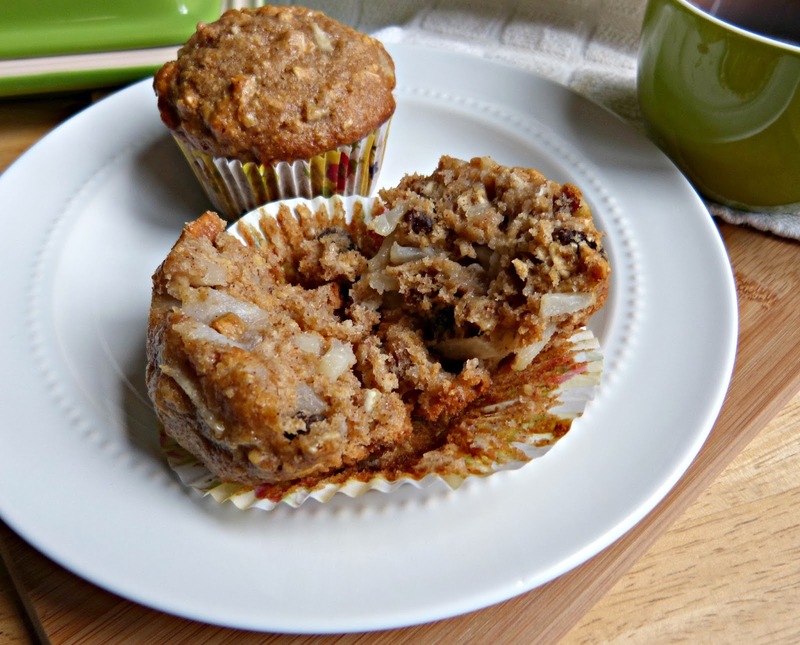 Try these Healthier Pumpkin Chocolate Chip Muffins! 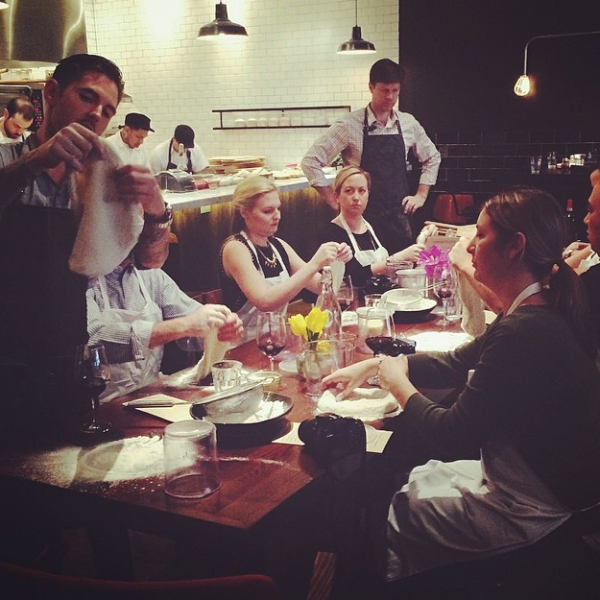 Take a class at La Scuola di Eataly? Check. Share the same air as and soak up the brilliance of a world renowned chef for an hour? Check. Chef Adrià is best known as one of the godfathers of molecular gastronomy. He incorporated revolutionary techniques into the preparation of food at his world famous restaurant elBulli (in Spain) for years before those techniques were considered acceptable in the food world. He brought this experience and these techniques to the folks at Lavazza to create new ways to taste coffee and then he stopped by Eataly to tell us all about them! First on the menu for us: Coffee Caviar. Coffee was dropped into a bowl of solution to create tiny pearls (or 'caviar') of coffee that popped in your mouth with an intense coffee flavor. It seems a little weird, yes, but chef Adrià reminded us that all cooking is "chemistry and physics," and a series of elements reacting to one another. It was a simple and real way to explain these new techniques-- because they aren't scary. They're just new. The chef used a siphon (you know, the can filled with nitrous oxide that you see Starbucks baristas shaking up and using to shoot whipped cream on top of your latte) to create a dairy-free "mousse" made of only espresso. It was incredibly light and airy and completely amazing that it could be made from espresso and air. The idea here came from all of those foams that you see at high end restaurants, but it translated really well. And the espresso flavor was super intense in this light mousse. He also referred to the siphon as "the devil," which the room found pretty funny. He was referring to the fact that when he started using less traditional and more avantgarde tools like this one in the early 1990's that many critics essentially freaked out. It's commonplace for kitchens to use new tools and techniques now, but back then Chef Adrià's methods were incredibly controversial in the food world. The third and final item that we tried was my favorite: the Spugna al caffe. This was affectionately referred to as 'coffee cake.' Because it was literally coffee and a poundcake mix mixed up in that siphon, sprayed into a paper cup, and microwaved for 30 seconds. And it created a delicious cake. Chef Adrià's lesson took me right back to the architectural theory classes that I had to take in college. His views on food, cooking, technique, and history are incredibly cerebral and he threw out theory after theory-- many of which, truthfully, were way over my amateur chef head. But what I did gather from all of his theories and anecdotes, is that just like when I learned that good architecture wasn't just about designing a beautiful building, cooking is so much more than creating tasty food. Later in the afternoon, Chef Adrià spent some time meeting Eataly visitors and signing copies of his book elBulli 2005 – 2011. And if you missed the book signing, here's something fun for you: Eataly’s Gran Bar Lavazza will offer guests a chance to purchase and taste one of Ferran’s limited-edition coffee creations, the very cool Èspesso through March 26! And what A Squared post would be complete without a gratuitous food photo? Well, after our class ended the lovely folks at Eataly fed us. And as expected, it was amazing! I was especially loving the baked cauliflower pasta and the tangy endive and radicchio salad. REALLY good stuff. 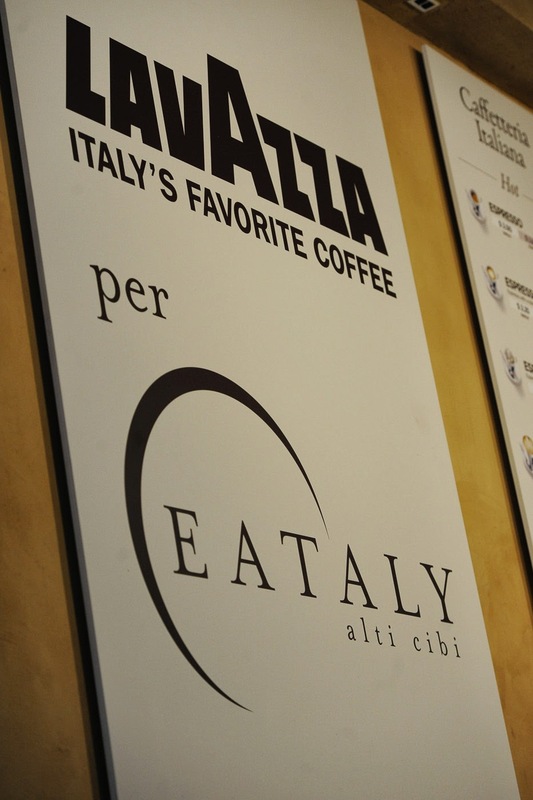 Thanks to the great folks at Lavazza and Eataly for this afternoon! I can't believe that I have never shared this recipe before, but this is my go to recipe for preparing salmon. I have been making it this way for years-- even back when I was a poor single party girl-- because it is super easy and salmon aside, is made with ingredients that I always keep on hand (see this post on pantry staples for more info). And you only need about a half hour to pull this entree together! I love the flavor of this salmon glaze. 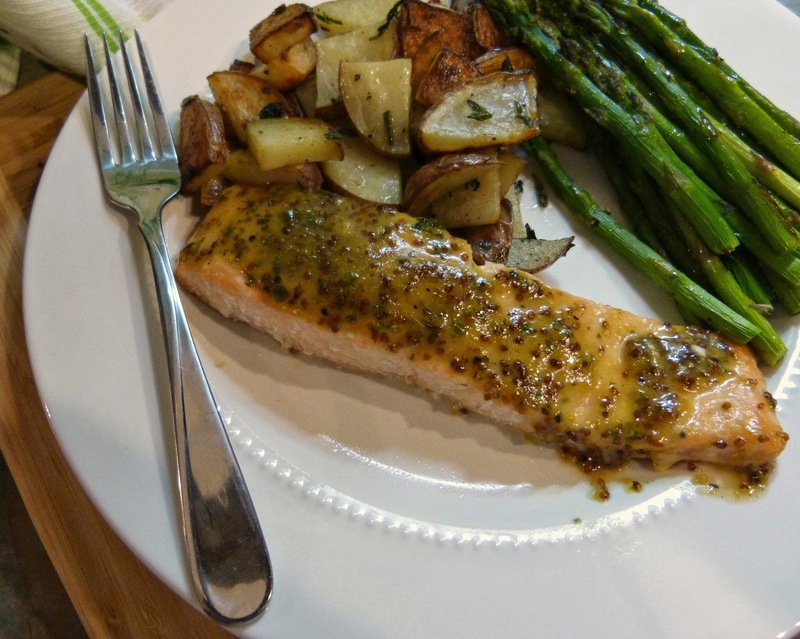 Sweet honey and spicy Dijon mustard pair so well together and with a little acid from the vinegar, it balances out really nicely on a fatty fish like salmon. I also love the combination Dijon and whole grain mustard here: The Dijon is spicy and creamy and the whole grain adds a really nice texture to the glaze. 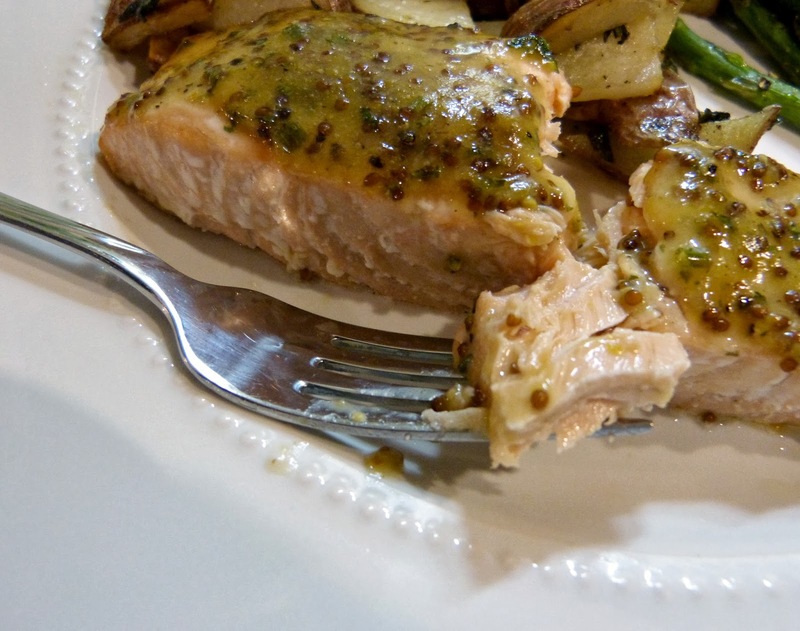 The salmon is moist, flavorful, and this is actually a really healthy way to prepare it. I like to serve it with roasted asparagus and either roasted potatoes or a side of rice pilaf. 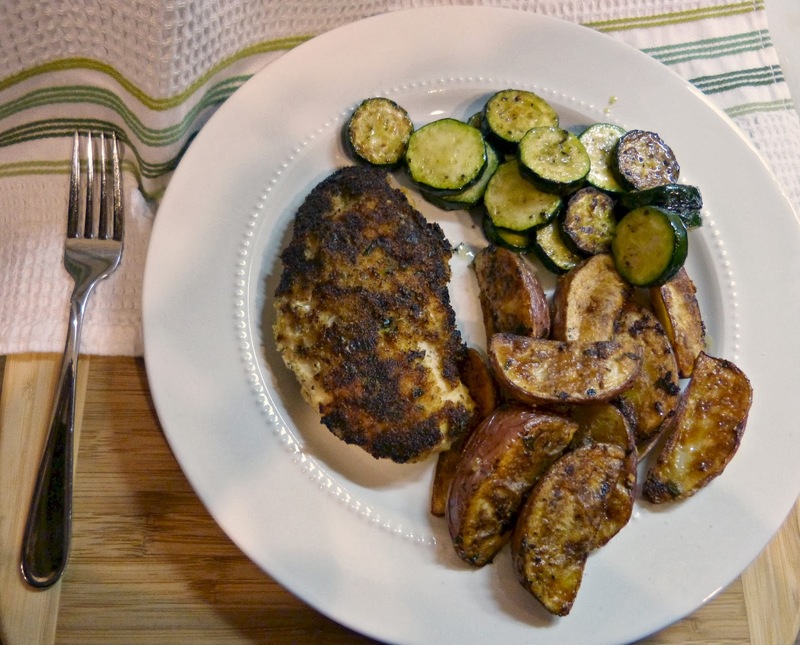 It's an easy, complete, and healthy dinner! Lightly grease the bottom of a baking dish with cooking spray. Arrange salmon fillets on top. In a small bowl, whisk together the remaining ingredients: oil through salt and pepper. Brush half of the mixture evenly over the tops of both pieces of fish. Bake for about 10 minutes, remove, and brush remaining honey mustard mixture on the salmon. Place the salmon back in the oven and bake for another 5-10 minutes or until center reaches desired degree of doneness. I like my salmon more opaque and less pink inside, so I lean more on the 10 minute side. If you love salmon, try this Grilled Sesame Salmon with Vegetables or this Pan Seared Cajun Salmon with Broccoli Slaw. So, I have been thinking for a long time that I wanted to find a fun way to bring the voices of other bloggers to A Squared on a more regular basis. I love it when the blogs I read feature their favorite bloggers-- it's a great way to get introduced to new blogs that you may not be familiar with yet. So, after kicking the idea around for a while I am excited to launch the Tastemaker Top 10 series on A Squared! Every week (hopefully) you'll hear from a new blogger answering the same (or similar) 10 questions about their favorite things in the food and restaurant world. I have a few great bloggers lined up already, but Regan from Up Close and Tasty (who you will hear from soon!) suggested that I take a page from my own book and answer these questions myself...so, to introduce you to the Tastemaker Top 10 I am including my answers below. And stop by next week to hear from our first guest blogger! 1. Favorite meal, food, or cuisine: Pasta. Always pasta. I could seriously eat it every day and in college, I think I did (which would explain my Freshman 15). It's so versatile and it's totally my go to comfort food. 2. Least favorite meal, food, or cuisine: Green peppers. If they are in a recipe I will sub in a red pepper without hesitating because I just hate the flavor of them so much. I also have a real issue with texture, so I just can't stomach things like oysters and flan. 3. 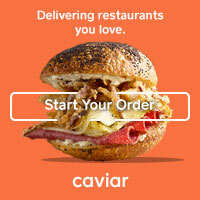 Favorite restaurant in your city: This is my own question and so very difficult to answer! I have to go with Balena on this one... it's Italian, which you know I love. And it's a great mix of modern and traditional, chic and comfortable, and with a solid menu full of food that I just love. I have written more about it here and here and here. 4. Favorite restaurant outside of your city: Another very difficult one to answer! I'm going to narrow this down to my favorite restaurants in places where I have previously lived-- so that's actually 3 restaurants. I spent a semester living abroad in Florence where I was obviously in pasta heaven. My hands down favorite restaurant there was Trattoria ZaZa, a casual trattoria serving delicious traditional Tuscan food (like their amazing pasta in walnut sauce). At college in Syracuse there was nothing better than Dinosaur Bar-B-Que, an amazing casual (read: divey) biker bar and barbecue joint. It was a staple when my parents came to visit (and my dad still raves about it) and I did a little happy dance recently when they announced the opening of a Chicago location in 2015! And finally, during my post-college years in Boston, Toro in the South End was a favorite. It was my first introduction to Spanish tapas and, little did I know that 7+ years and dozens of tapas later, still the best that I have ever had. 5. Favorite food memory: An easy one-- making Christmas cookies with my mom and siblings. It was a tradition for us year after year and I just loved that time cutting out, baking, frosting, and laughing with them. And the cookies are pretty much the best things ever. It's a tradition that I have actually coerced my husband into partaking in and something that I plan on starting with our future children too. 6. Favorite guilty pleasure food: Kraft Macaroni and Cheese. I know that it's not even real "cheese" and I can't remember the last time I ate it-- probably the last time I was really hungover, so it's been a while-- but it's just so good... Tater tots and French fries are close second here. This girl loves some carbs. 7. Favorite ingredient: Garlic is my hands down favorite ingredient to cook with. I think I have managed to add it to 90% of my dinner recipes. And if I am at a restaurant and see butternut squash, Brussels sprouts, or goat cheese in a dish you can almost guarantee that I will be ordering it. 8. Favorite recipe: This is like a favorite child situation for me. However, I have two that I always come back to: My mom's Chicken Divan is one. It's the only old school casserole recipe that I truly love and that I make pretty regularly. 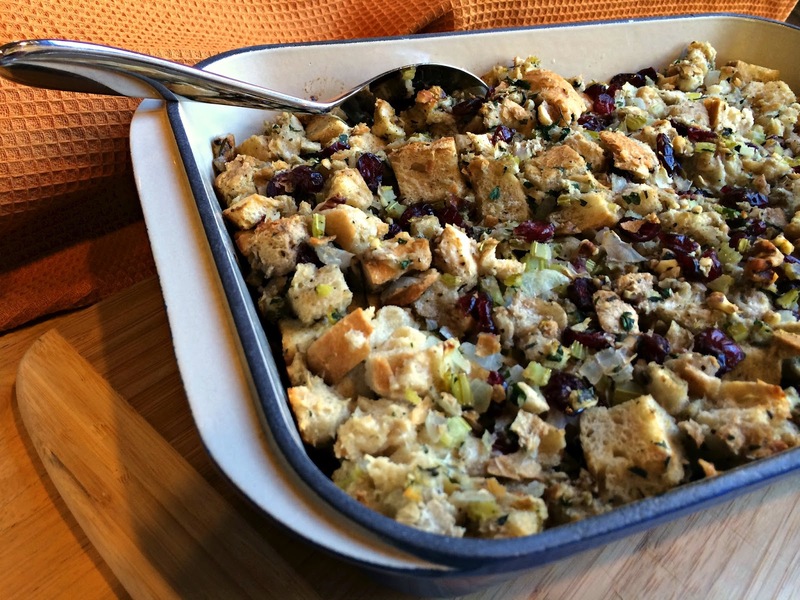 The second is my cranberry walnut stuffing. I have made it every year for Thanksgiving except for one-- and I really regretted it! 9. Favorite kitchen tool, utensil, product, etc. : I love my Cuisinart Smart Stick! It's an immersion blender, a whisk, a chopper, and works as a food processor for small quantities when I don't want/need to drag out my big food processor. And it's compact and perfect for my city kitchen where space is at a premium. 10. Favorite thing about blogging: I love having a place to go where I can be creative and talk about the things that I love. And the opportunities for cool events and the people (the other bloggers, in particular) that blogging has introduced me to has been truly priceless! This holiday is a BIG deal in Chicago and people here celebrated all weekend long. As an Irish girl I should be more excited about it... but instead, I spent the weekend getting my apartment organized, filing my tax returns, and starting a condo search (Eeeeee! More on that later). I did, however, create a new recipe using a few of Ireland's favorite ingredients: potatoes, bacon, and cheddar. And corned beef or soda bread aside, I don't think that there is anything better than a filling bowl of warm soup to enjoy with a nice pint of Guinness (or other green beer of your liking) on this Irish holiday. 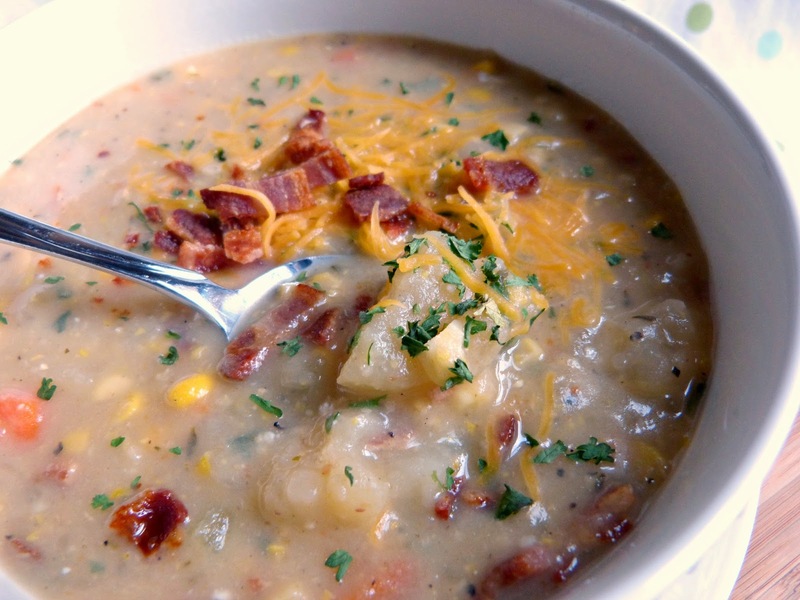 This chowder is the ultimate comfort food-- full of hearty potatoes, smoky bacon, and sweet corn. There are so many great flavors happening here and they marry together so nicely after slow cooking for hours. And if you can make it ahead of time, I think it tastes even better the next day! I also love that this is a full meal in itself and that because it is made in the slow cooker, it is pretty low maintenance to make. There is a little veggie and bacon prep work at the beginning and few finishing steps at the end, but those little touches really complete this chowder. Let me also point out that this is a hearty creamy soup, but that there's actually no cream in it. That creaminess comes from a few things: slow cooking and then partially pureeing starchy vegetables, a little low fat milk, some Greek yogurt and cheese. Not nearly as unhealthy as your typical chowder or potato soup. I know that spring is upon us, but if it's still chilly where you are (it sure is here in Chicago) then make up a batch of this chowder and thaw out inside while you wait for the weather to do the same! 1/2 tsp. smoked salt *I found Hickory Smoke Salt at The Spice House. Smoked salt is available at most major or gourmet grocers or at Williams-Sonoma. If you can't find it then just sub in another 1/2 tsp. of regular salt instead. Heat a medium skillet over medium heat. Add bacon to the pan and cook on both sides until browned and crispy. Transfer bacon to a paper towel-lined plate, being careful to leave the bacon grease in the pan. Once the bacon has cooled slightly, chop it into a small dice and set aside. Heat the bacon grease over medium heat and add onion, carrots, and celery to the pan. Saute for 5 minutes until the vegetables begin to soften slightly and then add the garlic. Saute for another 2 minutes and then scrape the vegetable mixture into a large cooker. *If your slow cooker has a saute functionality, then all of the above steps can be done right in the slow cooker-- not pan and stovetop needed. Cut the kernels off of all 4 ears of corn and add to the vegetables in the slow cooker. Add the diced potatoes and the next 8 ingredients (through broth) to the slow cooker. Stir in half of the diced bacon and cover. Cook on low for 5 hours until potatoes are tender. After slow cooking is complete, remove the bay leaf and the thyme branches (by this time most of the leaves will have fallen off and incorporated into the soup) and discard. Ladle 2 cups of the soup into a food processor and pulse until smooth. Stir the pureed soup mixture back into the slow cooker along with the milk, yogurt, and cheese. Combine and cook on high for 30 additional minutes, stirring occasionally. Season with additional salt and pepper as needed. 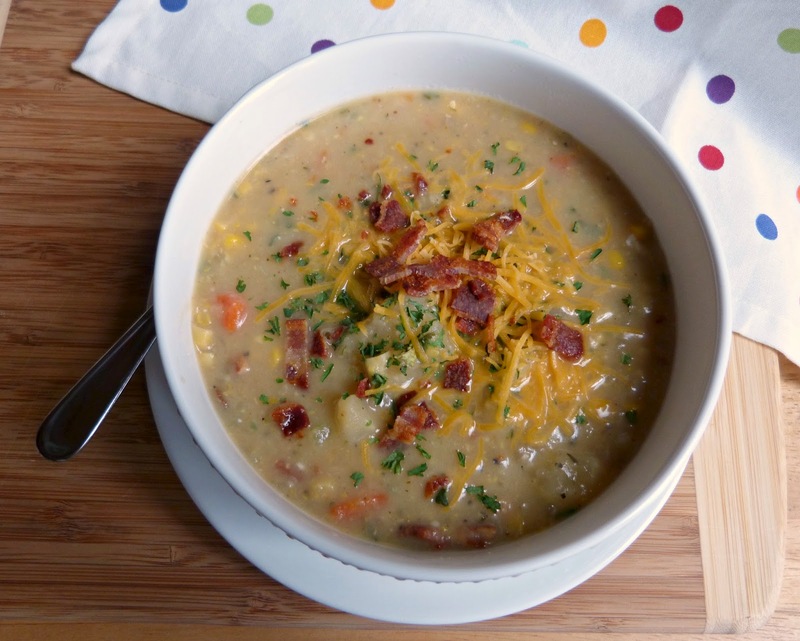 Ladle into soup bowls and sprinkle the top with a little more crumbled bacon. You could also garnish with additional shredded cheese, chopped fresh parsley, sour cream or Greek yogurt, or sliced green onions too. Looking for more slow cooker recipes? Try this Slow Cooker Thai-Style Pork Stew or Chianti-Braised Slow Cooker Pot Roast. One of the things that you readers are constantly asking for is more recipes for simple side dishes. Ask and you shall receive, dear readers. 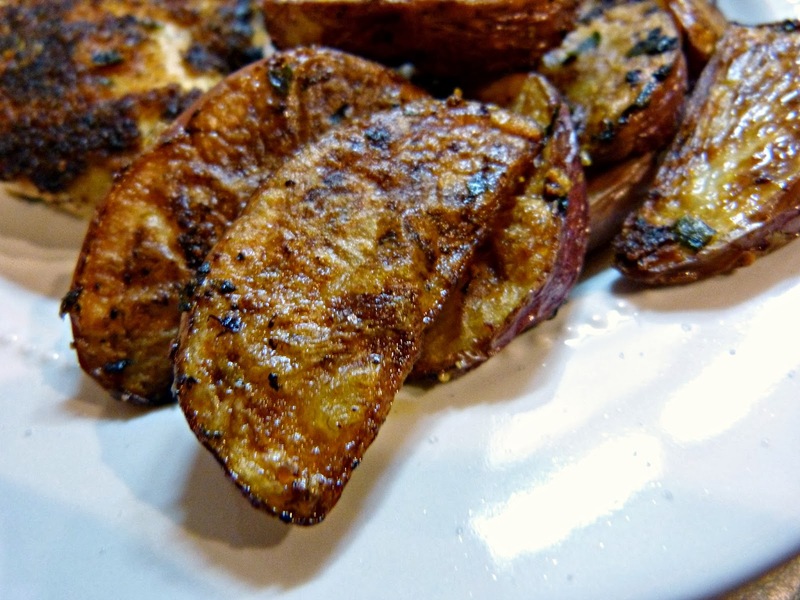 These oregano and garlic potato wedges are super tasty and addictive to eat. The fresh herbs and the combination of olive oil and butter really makes these potatoes special. They're crispy and flavorful on the outside, soft on the inside, and baked, not fried. I wouldn't necessarily call these potatoes "healthy," but compared to French fries or creamy mashed potatoes... yes, they are. These potatoes are a totally versatile side dish. We served them with a simple chicken breast and I think they'd be great served with any other grilled or sauteed protein too. In a large bowl, mix all ingredients until well combined. Spread out on a large baking sheet and bake for 15 minutes, until potatoes or browned on the pan side. Remove from oven, turn potatoes over to brown the other side and bake for another 10-15 minutes or until soft on the inside and crispy on the outside. Taste before serving and season with additional salt and/or pepper, if needed. Looking for another easy potato side? Try Dijon Roasted Potatoes or Oven Baked Fries!